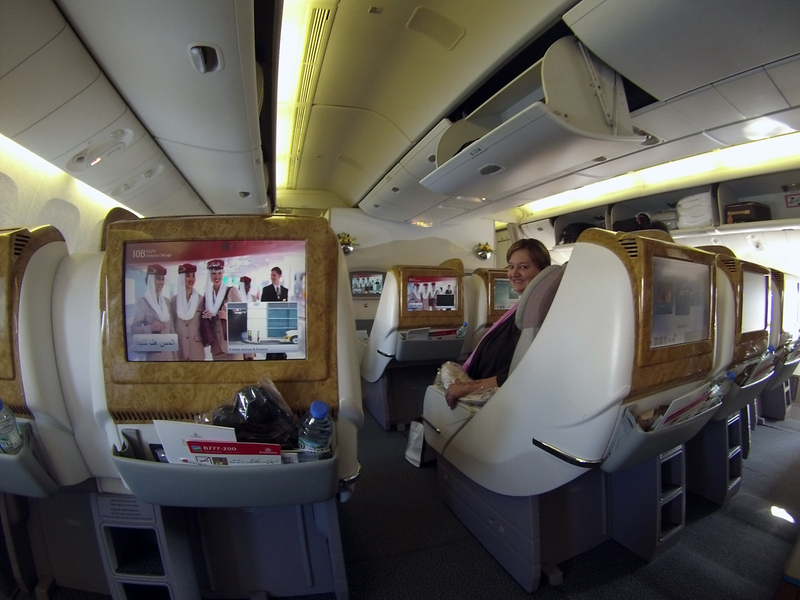 I recently took a trip to Dubai on Emirates Airline from Chicago O’Hare on Business Class. One of the amenities that you can expect before even boarding the plane is a private car pick up from your home where you will be directly taken to the airport for your flight. Once we arrived at Terminal 5, we were quickly welcomed in the Business/First Class check in and shortly after, an express TSA line. While you travel on Emirates First/Business, you can enjoy access to the Swiss Port lounge at the Chicago O’Hare International Terminal. A clean, modern lounge with free WIFI connection, a self service open bar and a fridge full of soft drinks and beer (that is too tempting not to pass up before boarding). Within about two hours until departure, I enjoyed the fresh made bites of fresh sandwiches, fresh fruit and veggies and a nice selection of desserts. On Emirates 777-300, Business Class is fully equipped with headphones, eye masks, socks, a nice pillow and blanket. The amenity kit for men was the best and fully packed with all you can possibly need to have a fresh start at your destination. The food and service was amazing. For appetizers, I had Traditional Local Arabic Mezze, soup; Cream of Cauliflower and Leek, and for main course; Grilled Lamb Rack, marinated with garlic and saffron, served with a creamy saffron sauce, roasted cherry tomatoes and shallots and zerach rice. Right after I was finished eating, I couldn’t resist to have my bed set up to lay flat to enjoy some of the latest movies or just listen to a radio station. One cool detail about Emirates planes is that when cabin service is finished and the cabin is dark, little stars will show up on the ceiling, perfect for the long flight ahead. Closer to arrival, breakfast is served along with mimosas with Moët champagne. In between, expect to be served small bites until you are ready to land. Overall 15 hours on a plane just became an experience to enjoy and Emirates is doing it right. I can’t wait for Chicago to welcome the arrival of Emirates fascinating A380 and all the extra amenities that I couldn’t see, however, for now we have Boeing 777-300 comfortable, large planes that will for sure make the long trip feel like a short one. 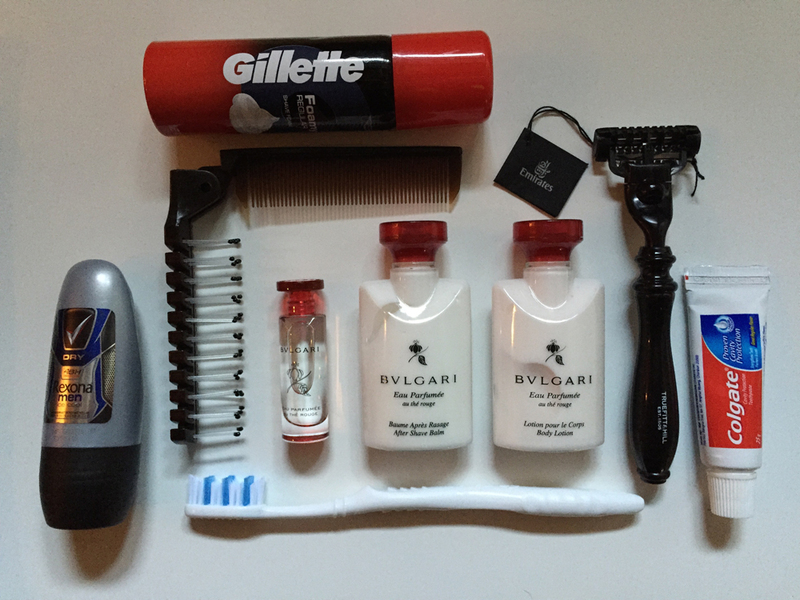 Forget your tooth brush, deodorant, shaving cream, brush and a few other things? Emirates has you covered. 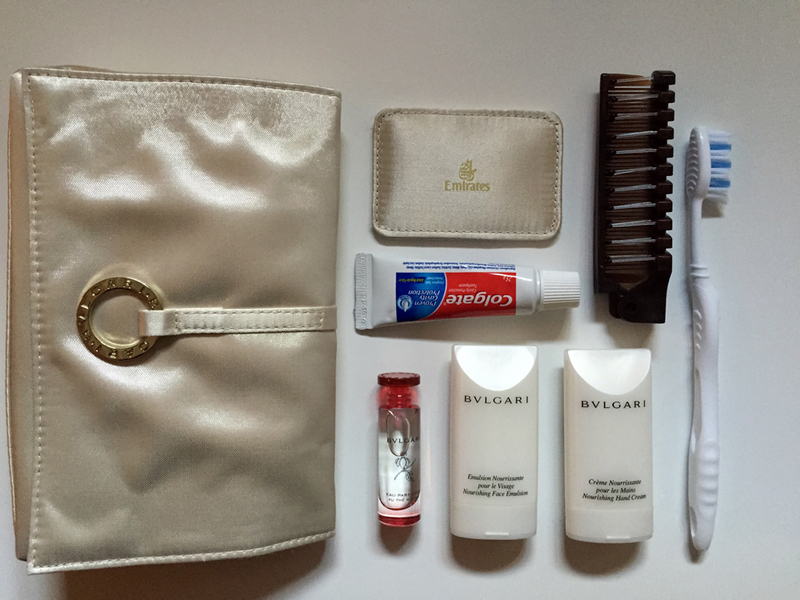 Check out his and hers Amenity Kits!